On the eve of the Huskies’ return to CAA tourney, UW AD Jen Cohen gave coach Mike Hopkins an extension. Smart move. Predators are everywhere. 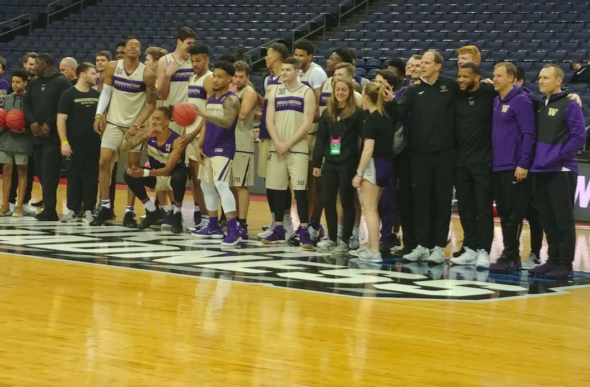 COLUMBUS, Ohio — For a gregarious guy who has been to 18 previous NCAA Tournaments as an assistant coach at Syracuse, Mike Hopkins was unusually low-key, maybe even tense, as the Huskies head coach lingered Thursday here around a milestone — Washington’s first appearance in the Big Dance since 2011. The source of discomfort certainly could have been a consequence of the quality of the first-round opponent. Eighth-seeded Utah State (28-6) may be a tad obscure to fans of the ninth-seeded Huskies, but the Mountain West Conference champs have an agile seven-foot center, Neemias Queta, and a 6-5 senior guard, Sam Merrill, who averages 21.2 points and is “one of the best players that nobody knows about around the country,” Hopkins said. The Aggies also have been absent from the tourney since 2011, but at practice Thursday at Nationwide Arena, site of the Midwest sub-regional, their size and athleticism made them look like they belonged. But Hopkins’ demeanor may have had another source — news came of an extension pushing his contract to 2025 with a raise, announced by UW during the day. The fact of it wasn’t surprising — he’s the first coach in Pac-12 Conference history to be named coach of the year in his first two seasons — but the timing was. News of coaching-contract extensions typically follow the tournament, and rarely precede it. The tourney atmosphere is replete with sufficient distractions to not self-impose another one. But the guess is here that UW athletics director Jen Cohen is hip to what happens following NCAA tourney success. The hot coach gets poached by a bigger, wealthier school. It’s as much a part of spring in college hoops as sunburns and heart attacks are part of the first nice spring day in Seattle. So Cohen fired a pre-emptive business strike. Doesn’t mean she’s forecasting a win in Friday’s game. Then again, nobody predicted the Huskies would have consecutive 20-win seasons for the first time since the 1952-53 teams featuring All-America center Bob Houbregs. Best to keep the predators at bay in the vicious business world of college hoops by circling Montlake with money. Hopkins, who signed a six-year, $12.3 million contract to leave Syracuse and its guarantee to have him succeed Jim Boeheim, is making $1.9 million this season, seventh among the public schools in the Pac-12. Until figures are disclosed, the guess is that Hopkins improved to around Hurley’s level at ASU. But Thursday, Hopkins was loathe to get anywhere near the humble brag to which he was entitled. At the pre-tourney presser mandatory for each of the eight teams here, he politely deflected several questions about the personal validation he took from doing the job well out west that many in his East Coast circle told him was hopeless. “There’s no question it’s all about leading a bunch of young men and a staff to win,” he said, “and to learn what it takes to be successful in life. They go hand in hand. That’s the sort of trite thing coaches say on such occasions. But awkward as it may have been for Hopkins to have to deflect attention by well-wishers, media and staffers gratified they won’t have to uproot, Cohen was right to pull the trigger now. Every year the industry gets a bit more lucrative, a bit more pressurized and a bit more tempting to the FBI to staff up a full bureau next to NCAA headquarters in Indianapolis. Once NCAA president Mark Emmert retires and turns over his Black Pearl to Capt. Jack Sparrow, the FBI will be forced to bust a move. Until then, Cohen has to play the game fast and hard, just as do players and coaches. More immediately, games are to be won, and thrills are to be had. There was pre-Sunday speculation that if Washington and Syracuse ended up together in the West Region, Hopkins might have crossed bracket paths with his mentor. Now that would have been special. But no, there’s not been much conversation between mentor and student, he said. Syracuse (20-13) was an eighth seed in the West and played Baylor Thursday night in Salt Lake City. The matchup would have been too much for Hopkins, who might be a more live-in-the-moment guy than Russell Wilson. Hopkins sometimes will drop in the middle of practice and do 20 pushups, just to burn off excess energy. If he was having a hard time handling a raise from Jen Cohen, a bro-hug from Boeheim might have made him drop and give us 50. Nobody wants to see that. Hey Art! That’s a hockey arena, right? (Blue Jackets) How does it look? How do you think the Seattle NHL arena will compare? Hopefully Hopkins can channel his inner Tippy Dye and defeat Utah State and North Carolina. Art, they had multiple consecutive 20 win seasons under Romar. One run of 4 straight and another of 2 straight. Excellent pre-emptive move by Cohen!